Dear Dan Ariely: May I suggest the following experiment. Invite people and promise them some money for a 15-minute task. Pay them the promised minimum and give them a test through which they can earn more. Construct it so that they can earn a lot more if they cheat. Then make the non-control group wait for half an hour. If I were in this group, I would have felt that I am owed for the total of 45 minutes—three times more than what I was promised. I do not know if I would cheat or just leave, but I wouldn’t be surprised that in this group people would cheat more than in the control group. I’ve just read this book recently (catalyzed by our conversation). I believe the experiment with sun-glasses was a different kind: with no promise, i.e. no baseline or expectations. When you introduce a promise, it is more like his experiment with annoying, rude representative when the upset customers cheated more – the Case for Revenge chapter. 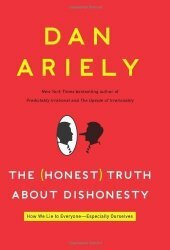 I tend to agree with him: the main reason for cheating is that we see more (little and not so little) reminders of cheating around us than reminders of honesty. Rationalization and revenge only help to push the limits further. Happy Birthday! My wish on your birthday – may you never have a reason for revenge.